The Van Cliburn Competition in Fort Worth enters its final phase on Wednesday, with six pianists — Davide Cabassi, Sa Chen, Chu-Fang Huang, Alexander Kobrin, Roberto Plano, and Joyce Yang — competing. This being the age of the Internets, you can watch live webcasts of the finals, and also follow some sharp debate on various blogs: the Cliburn's official blog, WRR Blog, the Well-Tempered Blog, and, in German, Thomas Vitzthum of Klassik.com, who writes ambiguously, "Fort Worth is not exactly the navel of the world." Who was the last classical musician to appear on the cover of Time? According to the magazine's website (if a search for "music" on the covers page does not lie), it was Vladimir Horowitz, in 1986. The last living composer to appear on the cover (excluding the polymath Bernstein)? Stravinsky, in 1948. Only one all-classical American composer has ever been chosen for the signal honor: Deems Taylor, in 1931. Among conductors, Toscanini appeared three times, Stokowski and Koussevitzky twice, and Beecham, Szell, Zubin Mehta, and James Levine (in 1983) once. Among composers, Richard Strauss appeared twice, Sibelius, Shostakovich, Mascagni, Britten, Stravinsky, and Johann Sebastian Bach once. Addendum: I missed Gian-Carlo Menotti in 1950. Here's another link to Drew McManus' "Take a Friend to Orchestra" project. This is not to advertise my own contribution, which will be familiar to anyone who's read me droning on here, but to draw attention to the fabulous welter of posts that Drew received in response to his central, simple question: How should people who already love the music communicate that love to others? Obviously there's no one answer, and many brilliant proposals are circulating. What counts most is the almost desperate enthusiasm that everyone has shown in tackling the problem. I liked Garth Trinkl's ideas about attending outdoor concerts, free rehearsals, chamber-orchestra concerts, and manifold other variations on the "orchestra" idea. Whether humble or exalted, ragged or hyper-professional, the live concert is the one that changes people's minds. The title of this post might sound like a mangled reference to the John Lennon song, but it's actually a nod to E. M. Forster's immortal description of the third movement of Beethoven's Fifth in Howards End: "...The music started with a goblin walking quietly over the universe, from end to end." Read the whole thing here; the relevance to TAFTO is obvious. Hurley's numbers have their own blog. My theory is that they are the opus numbers of various pivotal works by Schoenberg: Verklärte Nacht, the Six Orchestral Songs (4+8=12), The Book of Hanging Gardens (15 songs), the Five Pieces for Orchestra, the Five Klavierstücke (finished in 1923), and the Piano Concerto (written in 1942). Related: my post on Lost and Alias composer Michael Giacchino; Adam Baer's LA Times profile of Giacchino. Bryant Manning was watching the 70's Harvey Keitel movie Fingers when he heard the following line of dialogue: "You seem like a sensitive guy, man. I mean, you should be out in the streets listening to some Shostakovich, man." "Out in the real world there exist detailed plans, visionary projects for peaceable realms, all conflicts resolved, happiness for everyone, for ever — mirages for which people are prepared to die and kill. Christ's kingdom on earth, the workers' paradise, the ideal Islamic state. But only in music, and only on rare occasions, does the curtain actually lift on this dream of community, and it's tantalizingly conjured, before fading away with the last notes." Someone on eBay purports to be selling the Principessa di Belgiojoso's Érard piano, on which Liszt and Thalberg fought their famous piano duel. Bidding starts at 150,000 pounds. (Via Leo Carey.) In other auction news, the Strauss Daphne typescript I mentioned the other day went for 31,200 pounds at Sotheby's, three times as much as projected. No word yet on who the buyer was; we're hoping it was the Bavarian contingent. Click on the image to see genius in action! Since my freshman year of college, my compositional pen has lain dormant. I'm happy to report, however, that this morning I experienced a madly prolific spell of creativity. I am proud to introduce to the world, and in particular to the attentions of British copyright law, my three-act opera Tristan + Isolde, which bears certain superficial resemblances to the similarly titled Richard Wagner opera, though in truth there are numerous small but telling differences of tempo, dynamics, articulation, and instrumentation (a brief xylophone solo in the King Mark scene, for example); also my lovely orchestral tone poem Prelude to the Afternoon of a Fern and a song entitled "Hey, Jude?" in the key of F-flat. My first set of nine symphonies should be done by the end of the day. I look forward to receiving worldwide royalties from these powerful and original new works. Update: Marc Geelhoed of Chicago has been delving into the manuscripts of Beethoven's Fifth Symphony and has come to a startling conclusion: the eighth-rest at the very beginning of the work should in fact be an eighth-note G, meaning that the symphony's famous "fate motto" is not da-da-da-DAH but da-da-da-da-DAH. As Mr. Geelhoed's legal counsel in this matter, I, in turn, have been delving into the intricacies of early nineteenth-century Austrian law, and have come to the perhaps equally startling conclusion that Mr. Geelhoed is owed retroactive royalties on all performances of Beethoven's Fifth over the past two hundred years, including but not limited to recordings, electronic transmissions, print reproductions, Morse Code, and humming. Although I expect to receive a portion of these royalties myself, I wish to make clear that my primary motivation is not untrammeled greed but a simple desire to see justice done at long last. The New Yorker, May 30, 2005. It was in Paris that the liquid revolution of “Tristan und Isolde” first entered the bloodstream of the world. Wagner conducted the Prelude to the opera at three concerts in 1860, baffling most of the audience with his art of endless melody, his chords of longing that never resolve. But the bohemians of Paris fell into a trance—at one of these concerts, Baudelaire experienced “love unbridled, immense, chaotic, raised to the level of a counter-religion, a Satanic religion”—and the phenomenon of Wagnerism began. Shock effects of the mass-market or avant-garde variety are now so routine that we no longer know what it’s like to go slowly, majestically, and irreversibly over the edge. Leave it to the director Peter Sellars to make “Tristan” mind-bending once again. His production of the opera, created in collaboration with the video artist Bill Viola, was first seen last fall, in semi-staged form, at Disney Hall, in Los Angeles, and the definitive version opened last month at the Opéra Bastille, in Paris. I saw the last performance of the Paris run, and came away in something like the state of dazed bliss that Baudelaire described. The dominant presence in this Southern California “Tristan” is Viola, whose images play for almost the entire duration of the opera, on a screen behind the singers. The artist has in common with Wagner a disdain for the rhythms of daily life: in his work, events often happen in slow motion, so that they acquire an atmosphere of sacred ritual. Much of the first act of the “Tristan” video is taken up by footage of a man and a woman walking toward the camera, removing their clothes, and washing themselves at a fountain. The compositions have a glowing clarity, like Renaissance frescoes. The faces are devoid of obvious emotion, yet are focussed by meditative feeling. There are few direct traces of the medieval legend on which Wagner based the opera: no ship on which Tristan brings Isolde to King Mark, her appointed husband; no garden where the lovers conduct their secret tryst; no castle where Tristan suffers and dies. Yet, on another level, the film is obsessively faithful to the human and natural elements that Wagner obsessively invokes—faces, eyes, hair, bodies, air, fire, earth, water. Water above all: this production may be remembered as the “Tristan” that goes beneath the waves. Wagner’s libretto is soaked in water from start to finish; Act I begins with a sailor hailing the ocean, and Act III ends with Isolde preparing “to drown, to sink—unconscious—highest bliss!” Viola, likewise, dwells at length on the sensation of immersion. One visually astounding moment occurs after Tristan and Isolde imbibe the love potion, in Act I. For several minutes, the screen is featureless except for two tiny human figures, intertwined and gesturing. Then the bodies fill the screen, and the screen seems to bend and bubble with them. It turns out that we have been watching from the bottom of a pool of water as the couple dive in. The plunge coincides with a crucial moment in the score—the moment when the arching phrases of the Prelude are heard again, setting in motion the first great love duet. Some operagoers in Paris complained that Viola’s work distracted from the efforts of the singers and players. I didn’t have that problem, although it took me a quarter hour or two to grow accustomed to the overlapping of onscreen and onstage action. Because the images move so slowly, they don’t impose a competing montage rhythm. Instead, they are subsumed by the flow of Wagner’s music. I found myself listening with heightened alertness, as if the film were bringing Wagner into sharper focus. The images seemed to arise from the subconscious of the score, from the mysterious nexus where words become notes. After all, there can be no better metaphor for the experience of listening to Wagner than a plunge into deep blue water. Sellars achieved the remarkable feat of erasing his own presence. The long-reigning activist director has not lost his power to confound; in a recent Carnegie Hall staging of György Kurtág’s “Kafka Fragments,” he induced Dawn Upshaw to apply a prop steam iron to her face. But there was nothing outré in the “Tristan” production. Sets were minimal, the stage action incisive and straightforward. Only once did Sellars dramatically intervene: at the end of Act I, when Tristan and Isolde break out of their first duet to land on the hostile ground of Cornwall, the houselights went up, cruelly dispelling the magic of the love-potion scene, and King Mark was discovered standing in the middle of the orchestra seats, silently staring up at the lovers. That bone-chilling apparition not only forecast the eventual tragedy but also had the effect of putting the film in its place: live actors asserted their flesh-and-blood presence. The characters in the video seemed to have a sadness to them, as if they knew that they were trapped in a digital world, whereas the singers exulted in their freedom. The leads were Waltraud Meier and Ben Heppner, both in great voice. Meier’s Isolde is a familiar quantity, but still unpredictable; her cutting accents, her way of flaring the end of the phrase, her precise but spontaneous-seeming stage gestures convey every hairpin turn of emotion. Heppner has emerged from a rocky patch with his voice in better shape than ever. A couple of years ago, listening to him was an anxious experience: you cringed in expectation that his gorgeous legato would run aground on a cracked note, which it periodically did. Now the voice seems solid to its roots, and Heppner has the confidence to take the risks that make for a raw, hair-raising Act III. Yvonne Naef, as Brangäne, held her own against Meier with a bold, deep mezzo tone. The weak link in the cast was Franz-Josef Selig, an effortful, leathery King Mark. Esa-Pekka Salonen led the pioneering performances of the Sellars-Viola “Tristan” in Los Angeles last fall, and he travelled with the production to Paris. He offered a hugely impressive interpretation of a score on which almost every great conductor of the past century has made his mark. Already in the Prelude, you had a sense of a canny master plan, with crescendos plotted like parabolas of expanding size. Not unexpectedly, this contemporary-minded conductor made much of the work’s sharper edges: he had the violins lean on a passing note in the Act III prelude, highlighting a brief semitone clash. There was a startling sonority in the scene of Tristan’s death: the wind and brass choirs were eerily glassy and smooth, almost electronic in timbre. For the most part, though, this was an authentically Romantic reading, not a revisionist one. True to the atmosphere of the production, it had a surging and ebbing natural rhythm. The Paris Opéra is now under the direction of Gerard Mortier, who led the Salzburg Festival from 1991 to 2001. Much of what Mortier did in Salzburg has gone down in the annals of pseudo-transgressive opera direction; his Paris regime will undoubtedly bring more of the same. But he also knows real talent when he sees it, and he is a longtime supporter of Sellars’s ventures. His programming for next season knocks sidewise that of any opera house in America: a return of this “Tristan,” under Valery Gergiev; a revival of Hindemith’s Weimar Republic shocker “Cardillac”; a general repertory running from the Baroque to the avant-garde; and, most important, the world première of Kaija Saariaho’s opera “Adriana Mater.” Perhaps Paris audiences, which ceased to be surprised sometime between Stravinsky’s “Rite of Spring,” of 1913, and George Antheil’s airplane-propeller concert, of 1926, will teach Mortier the futility of inciting the bourgeoisie. Better to humble them with transcendence, as this “Tristan” does. I can think of maybe fifty works that should have been introduced into the Metropolitan Opera repertory in advance of Franco Alfano’s 1936 mediocrity “Cyrano de Bergerac,” which just had three performances at the house. Start with Strauss’s “Daphne,” Nielsen’s “Maskarade,” Britten’s “Gloriana,” and Messiaen’s “Saint Francis.” Why is the Met wasting its time on a lesser work by a lesser composer who is best known to operagoers for having made a garish mess of the ending of Puccini’s unfinished “Turandot”? Because Plácido Domingo likes the piece, and Domingo is one of the few singers who can still sell out the house. The Met has fulfilled the tenor’s whim with a classy show. Francesca Zambello directed the production, in picture-postcard rather than provocative mode. Sondra Radvanovsky, a new Met star with an unforced, luminous, richly expressive soprano voice, sang opposite the inexhaustible Domingo. Marco Armiliato conducted enthusiastically. But no amount of fabulosity can redeem the opera itself, which must have seemed like a stopgap even at its première. Alfano hardly lacked talent. He wrote expertly for the voice; he had an ear for quirky tonal harmony; his orchestration glitters like the best of Nelson Riddle. An Italian who longed to be French, he copied Debussy, Ravel, and Les Six more than he did Puccini. There are subtle, wry, poignant moments scattered through his adaptation of “Cyrano,” including a very haunting “Pelléas”-like duet for the hero and Roxane at the end. But whenever Alfano feels a climax approaching he goes in for crude, gassy, Technicolor sounds, of the sort that make his completion of “Turandot” so intolerable. It’s as if he didn’t trust his finer instincts to make an impression. The contrast with the man who wrote “Tristan” could not be more extreme. New music rules New York this week. Tonight (Monday), the American Contemporary Music Ensemble will present a "21st-Century Schizoid Music" concert at Cornelia Street Café, with NewMusicBox's Frank Oteri as host. Program runs gamut from Ives' venerable Second Quartet to Reich's New York Counterpoint to Nico Muhly's Keep In Touch, a superb new piece for viola and electronics featuring the recorded voice of Antony from Antony & The Johnsons. On Tuesday and Wednesday the Ensemble Intercontemporain plays in Lincoln Center's "Sound Projections" series under the direction of Jonathan Nott. 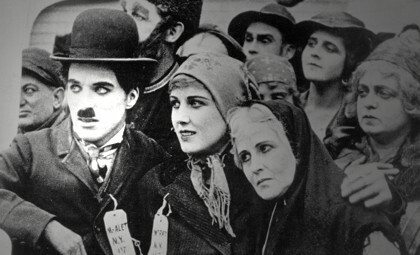 Tuesday's concert is the local premiere of Benedict Mason's ChaplinOperas, wild live music to accompany three classic Chaplin shorts. (Don't miss Allan Kozinn's Mason profile in the Times.) Wednesday's show combines Ligeti's dreamlike Piano Concerto with Wolfgang Rihm's ferocious Jagden und Formen. On Thursday, NOW Ensemble plays at the Church of Christ and St. Stephen's. On Friday the Line C3 percussion group appears at Tenri Cultural Institute; more Muhly (Ta and Clap), more Reich (Drumming Part 1). And on Sunday the New York Youth Symphony presents the premiere of Today and Everyday by Judd Greenstein, who has already been touted in this space. BBC 3 will be airing Lorin Maazel's already infamous opera this Wednesday at 7PM GMT. Details at On an Overgrown Path, our new choice blogstination. Update: WFMT Radio Network will release 1984 for American broadcast on June 17th. If you were to tell a roomful of musical pundits that the question "Whither Opera?" has become tiresome, inevitably the conversation would turn to "Whither the Symphony?" Is there a future for the symphony? Or did it die out long ago, with Mahler, Sibelius and/or Shostakovich? Alas, this topic is even more tiresome. The symphony has been a malleable form all along, re-invented by every composer who seriously addressed it. In the hands of contemporary composers as diverse as Robert Simpson, Witold Lutoslawski, Alfred Schnittke and Per Nørgård, it remains a vibrant organism, resisting musicological autopsies and epitaphs. Signs of life could be clearly read in the Symphony No. 11 of David Diamond, given its world premiere Thursday night by the New York Philharmonic under Kurt Masur. This flawed but intensely ambitious work sprawls across three-quarters of an hour, defying a public that prefers to digest new music in 20-minute morsels. In the best tradition of Schubert and Bruckner, the structure is capped with a finale that throws out a superfluity of themes and goes on way too long. Mr. Diamond's familiar acerbic harmonies and terse lyricism held sway, giving the piece a somewhat antique sound throughout. But the confidence and conviction of the voice were unmistakable and, in the end, rather impressive. The choice of Mr. Diamond for a 150th anniversary commission is especially apt because the Philharmonic premiered his First Symphony 51 years ago. Afterward the composer endured considerable stretches of obscurity, in spite of the efforts of Leonard Bernstein, who began his recording career with Mr. Diamond's "Prelude and Fugue No. 3" and later introduced the Fifth and Eighth Symphonies with the Philharmonic. Unlike Bernstein, Mr. Diamond never made a pretense of concealing his homosexuality, and suffered as a result. Now aged 77, he sounds a fierce tone that one might expect in the music of a much younger composer; at the same time he allows himself a rhetorical expansiveness, affirming not only the much-deprecated symphonic medium but his own difficult and determined career as well. The Symphony No. 11 is in four movements, with brief semi-tonal themes appearing cyclically throughout. The first movement puts various motifs into play at once and develops them rigorously; the emphasis is on argumentation rather than atmosphere. The symphony's architecture widens in the Adagio, which is founded on a characteristically eloquent elegy for strings. In a note, Mr. Diamond mentions that the symphony was composed with the strengths of Kurt Masur and the Philharmonic in mind, particularly their aptitude for Bruckner; the Adagio's massed chorales and long crescendos have a Brucknerian heft, although its longer lines are clipped with an accent entirely Mr. Diamond's own. The third movement is an "Allegro burlando" that doubles as a satiric concerto for orchestra. Surprising solos are spread throughout, with generous writing for glockenspiel and tubular bells; the concertmaster has the dominant role, although he is encroached upon by the leftmost member of the second violins. The comedy has a dark and obsessive tinge. The enormous finale suffers from a lack of contrast; perhaps Mr. Masur should not have made a large cut halfway through, or perhaps he should have cut more. Overall, the performance gave a good picture of the score, but seemed not to make the most of it. The outer movements sometimes lacked alert rhythmic definition, an idiomatic swagger; the coda sounded tentative and abrupt. In the magnificent Adagio, however, the strings and brass sang out with commitment and eloquence. Glenn Dicterow deserves praise for his brilliant execution of the scherzo's fiendish solos. Mr. Masur filled out the program with proficient, unremarkable readings of Brahms's "Academic Festival Overture" and Beethoven's Symphony No. 4. The Brahms began with a handsome tenseness of atmosphere, but never quite broke loose into rough jubilation. 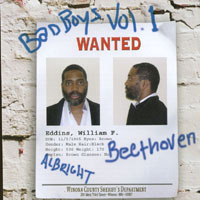 And while the Beethoven was very smoothly played, its attacks were not quite crisp enough. These excursions into familiar repertory seemed overshadowed by the colossal effort of the Diamond premiere, which all told should stand as a highlight of the current celebratory season. Every week that I'm on the road someone, at some point, will get to the moment in the conversation where they discover that I'm a musician. Usually they are very intrigued. Then they learn I play the piano, which frequently generates stories of how their parents tried desperately to get them to learn the instrument but they didn't have the time/patience/whatever. This last part is always accompanied by a certain wistfulness in the eye that betrays that they wish they had kept at it. But then comes the fateful moment that they discover that I play – gasp! – Classical music. Not only that, I'm that rarest of the specie Homo Musica Musicallis – a CONDUCTOR! Instantly the barrier comes up. They look at me like I'm some Old Testament prophet baying at the moon. I guess the fact that I'm a black guy from Buffalo dressed in jeans, dark sunglasses, a t-shirt, and sporting a silver cuff in my left ear had thrown them off. Gee I wonder why? I look in the mirror and I could just swear I look like a typical conductor. Well, the next several minutes is spent with me trying to assuage them that: 1) No, I don't sleep in a coffin during the day; 2) Yes, I love garlic; and 3) what I do is not the cultural equivalent of selling your soul to Bill Gates (I use Macs anyway). If I manage to calm them down enough then I can move on to #4 – "Say, would you like to come to one of my concerts?" Critical to this idea is getting the mark's email address so that you can hound them mercilessly over the next couple of days. ...I can't help but believe that Mozart, Beethoven, Mahler, whomever, would be down right sick to their stomach with the hero-worshipping over-glorifying idolizing holier-than-anybody veneration that's thrown at them these days. They wrote music to be enjoyed. Please do not approach them as if they are the 2nd coming of Christ. As it is many of the best composers were Jewish, so that's not going to fly at all. Now, if by some odd chance you liked the concert then please applaud, whistle, holler, jump up and down, but definitely do not spare one second worrying about the "stick-in-the-mud" next to you who believes in (the next phrase said in a exaggerated British accent) "proper concert hall etiquette." Said person needs to get over their bad self. Drew has set up ticket discounts at orchestras around the country, and even offers Take a Friend to the Orchestra merchandise, including a Kyle Gann T-shirt with the legend “Some of you people may think I’m underdressed…but somewhere, Kyle Gann is cheering for me!” That honestly blows my mind. 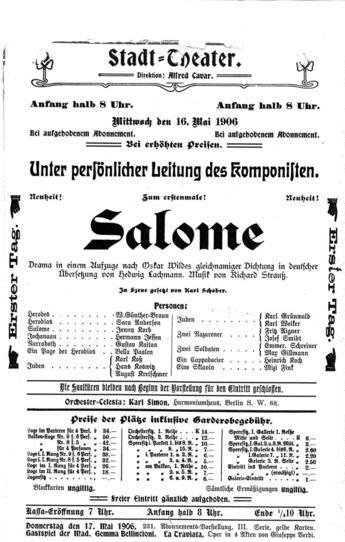 When Richard Strauss conducted his sensuously savage opera Salome on May 16, 1906, in the Austrian city of Graz, the crowned heads of European music gathered to witness the occasion. 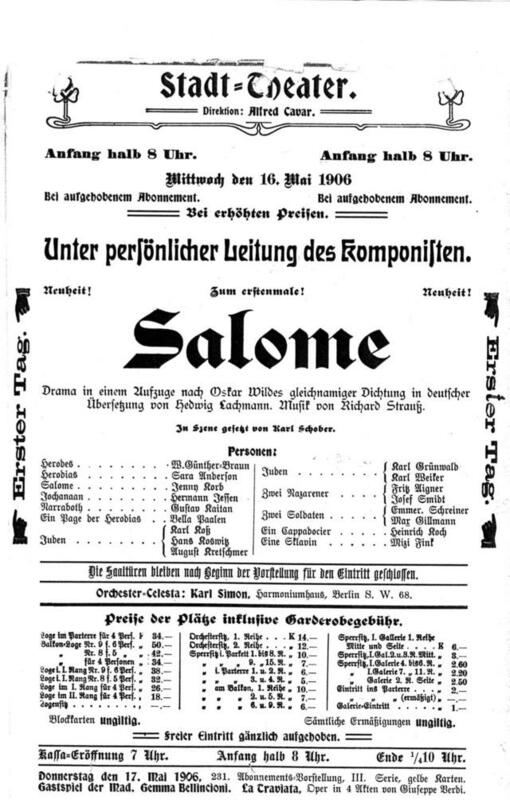 The world première of Salome had taken place five months before, in Dresden, whence word had spread that Strauss, the master provocateur of German music, had created something beyond the pale—an ultra-dissonant Biblical spectacle, based on a play by a recently deceased British degenerate whose name was not to be mentioned in polite company; a work so frightful in its depiction of adolescent lust that imperial censors had banned it from the Court Opera in Vienna. 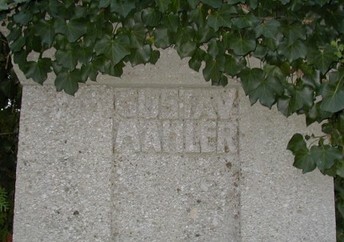 Gustav Mahler, the Court Opera’s director, attended with his wife, the beautiful and controversial Alma. Giacomo Puccini, the matinee-idol creator of La Bohème and Tosca, made a trip north to hear what “terribly cacophonous thing” his German rival had concocted. The bold young composer Arnold Schoenberg arrived from Vienna with his brother-in-law, Alexander von Zemlinsky, and no fewer than six of his pupils. One of them, Alban Berg, traveled with an older friend who left a memoir of the occasion, describing the “feverish impatience and boundless excitement” that all were feeling as the evening approached. Raoul Auernheimer, a protégé of Arthur Schnitzler, was one of several rising literary stars in attendance. The widow of the waltz king Johann Strauss, no relation to the composer of Salome, represented old Vienna. Ordinary music-enthusiasts filled out the crowd—“young people from Vienna, with only the vocal score as hand luggage,” Strauss noted. Among them may have been an Austrian teenager named Adolf Hitler, who had just seen Mahler conduct Tristan und Isolde in Vienna, on the night of May 8th. Hitler later told Strauss’s son and daughter-in-law that he had borrowed money from relatives to make the trip to Graz. "I've learned not to look at my music as sacrosanct." I haven't heard Lorin Maazel's 1984, which was roundly though not universally panned by English critics. Even if it turns out to be a masterpiece, Tony's point still holds: we're facing a grim future if opera commissions are awarded to whoever can most readily take care of money matters in advance. ("If you have the means, you develop your own opera," director Robert Lepage said of the 1984 situation.) Opera companies should be putting their main resources into premieres, not using them as a way of getting a new production almost for free.